Home Campus Central News ENTREPRENEURSHIP IN DU: COMING RIGHT UP! ENTREPRENEURSHIP IN DU: COMING RIGHT UP! Delhi university, in a recently established agreement with a non profit organization, Dhriti has introduced an entrepreneurship course in certain colleges across the varsity. A three-month entrepreneurship course was initiated in SRCC, and then went on to be conducted in Ramjas, Gargi and Miranda House. The specialty of this course is that instead of just sticking to conventional theoretical practice and guest lectures; it encourages the students to initiate their own venture with the help of a live project. Dhriiti is a unique organisation that promotes and protects Small and Medium Enterprises (SME) and helps build and create a spirit of entrepreneurship amongst the next generation of Indians, the youth. How do I make money out of my passion? What if I start my own business? But how? What does it take to be a successful entrepreneur? Who’ll support me? If these are the questions which come into your mind every now and then and if you think you have the aptitude to start your own venture, then you don’t need to stop on these questions anymore, for all you wanted to know about entrepreneurship is now be available to you in Delhi University. The concept of entrepreneurship among the youth is a highly new concept in India while it has been going on successfully in the US and its counterparts since a long period, and this course is here to promote just that. The next session starts in the third week of October in LSR. Colleges like Miranda House and LSR have also started their own entrepreneurship cell to promote entrepreneurship among its students. 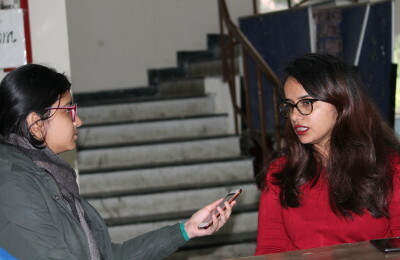 Ambika Ghughe, President of the Entrepreneurship Cell in Miranda House states, “Academic inclination in Delhi University is high, but not directly in tune with what is required in the real world. Students, through this initiative, get the feel of how initiatives are taken in a corporate world, and view the same not from the point of view of an employee but an employer.” The cell has also recently collaborated with the Miranda House Vatavaran Project dealing with recycling and plans to take it on a higher level. The students also get the opportunity to interact with prospective funders based on the credibility of their project via the course. The course is also supplemented with an exposure trip to study the working of an enterprise. Last year the students were taken to the Gujarat Cooperative Milk Marketing Federation (GCMMF). All that the students require to be a part of this course is to have the attitude, aptitude, an idea, and the zeal to bring it to life. Enterpreneurship cell should also be available for open( ie. School of open learning). Dhriti has introduced an entrepreneurship course, which should be also available to sol students..